Introducing our premium line of awnings developed with the same engineering excellence you’d expect from SunSetter. We’ve incorporated the comfort, protection, and lasting quality of our awnings, with an enhanced style that’s perfect for the sophisticated home. A straight valance exudes modern elegance. 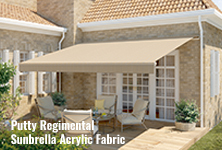 World-renowned Sunbrella fabric offers unparalleled beauty and protection. A 10-Year Limited Warranty guarantees excellence in craftsmanship and enjoyment for years to come. 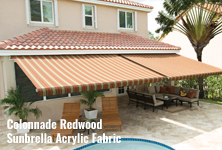 Luxury meets function with these remarkable awnings, built right here in America. We have the awning for you! Check out the Platinum Series models below. Projection: 8 ft. width extends 7 ft. from the wall. 10 ft. - 11 ft. width extends 9 ft.
12 ft. - 20 ft. width extends 10 ft. 2 in. Minimum Mounting Height: As low as 7 ft. 6 in. 12 ft. - 18 ft. width extends 10 ft. 2 in. *Sunbrella is a registered trademark of Glen Raven, Inc. This optional coverage goes above and beyond our standard 10-Year Limited Warranty to give you the utmost in worry-free peace of mind. It covers the awning frame for craftsmanship, plus wind and weather damage as well for a full 10 years.